If you’re a student of Biblical Hebrew, there’s not much more to say than buy this book! There’s no way around it: learning a new language requires regular vocabulary acquisition and practice. Otherwise, as the authors rightly note, “beginners who master the basics soon realize that their limited word stock stands in the way of fluid reading and an intuitive grasp of the biblical text” (16). Traditionally, students learn the basics of Hebrew Grammar and then move on to an exegetical course that requires students to memorize lists words according to frequency. Such an approach is reasonable and, one might say, necessary. The broad range of vocabulary usage in the Old Testament and the disparate nature of the literature necessitates that readers have a basic ability to translate the most frequently used terms within the corpus of literature she studies. However, frequency based approaches—which the authors themselves encourage (16)—can be just as tedious and frustrating to memorize as constantly looking up unknown words in a lexicon as the student plods her way through the biblical text. There is no conceptual framework in which to place the new words. New vocabulary is entirely detached from the already existing memory bank; there is no interconnectivity, which makes long term memory all the more difficult. Pleins and Homrighausen’s guide for nouns—yes, it unfortunately only includes nouns—seeks to provide a solution to this problem. Terms are conceptually arranged so that all the nouns found in the Hebrew Old Testament related to the body, cosmology, food, drink, etc. are grouped together. Each entry contains glosses, a biblical reference that clearly illustrates the selected gloss, and reference to important dictionaries when the provided gloss may be questionable. The volume also includes essential indices: one for each word and where to find them in the guide and another that provides further reading on the categories used within the volume. Those who create appendices don’t get enough credit for the tedious nature of task they must accomplish and I, for one, am impressed by the particularly arduous nature of creating the appendices for this volume. They will serve users well! As a concluding note, what I find to be most significant about this volume is the fact that it is one of the closest things we have for Hebrew—that I’m aware of—that resembles Louw and Nida’s watershed dictionary for New Testament Greek, making it not just helpful for students looking to expand their Wortschatz, but also for those seeking to gain a better understanding of a biblical Hebrew word’s semantic domain. My only complaint about the guide is that I didn’t have it at my disposal almost a decade ago when I started learning Hebrew. I will, however, be regularly using it when I look to refresh my own vocabulary and whenever I have the opportunity to teach Hebrew in the years to come. Kudos to Pleins and Homrighausen for providing us with an essential tool for learning biblical Hebrew. Thank you to Andrew for pointing out the existence of the Semantic Dictionary of Biblical Hebrew, available online. I will be making regular usage of it in the future. The Lexham Discourse Handbooks have just been published. This project was a collaborative effort between Steve Runge, Kris Lyle, Rick Brannon, James Lanier, and myself. My contribution was to write—most of—the 1 Thessalonians volume. 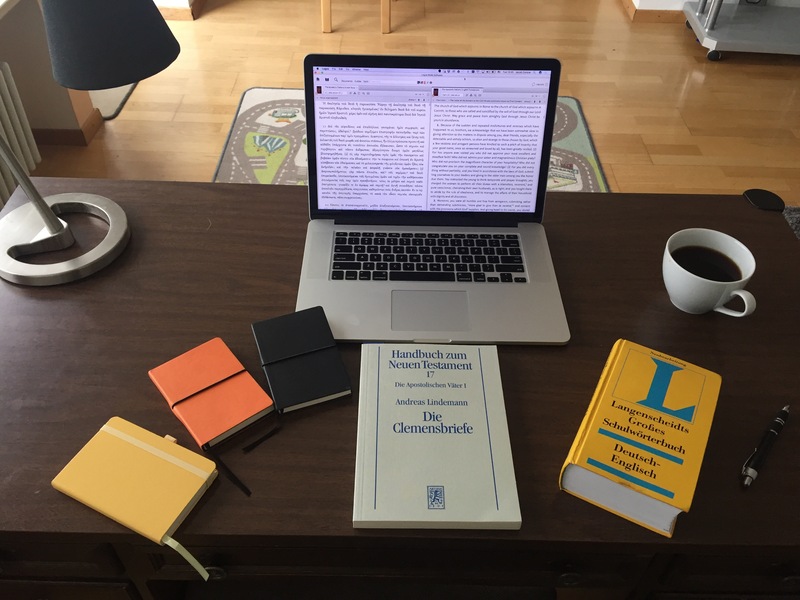 You can learn more about the project and what sets these volumes apart from other handbooks or commentaries over at Old School Script, where Kris Lyle details the and provides examples of the benefits they bring to the table. I’m excited to see my mentor’s new book Running My Race now out and for sale. I was lucky enough to win a copy from his blog and it just arrived in the mail. I can’t wait to dig in and learn from the man who has taught me a great deal about life, teaching, and research. I’m thrilled to get the chance to learn once again. My good friend Thomas Hudgins has just successfully defended his PhD dissertation. Hop on over to his blog to read about it and congratulate him! This study of Jonah utilizes discourse analysis to draw out both major and minor differences between the Greek (Septuagint) and Hebrew text forms of this ancient work. Specifically, it places emphasis on intentional and/or unintentional translational differences that have influenced Jonah’s meaning and rhetoric. Into the Deep explores and exposes numerous difficulties encountered when translating literature, such as the prospect of altering a text’s unique characteristics. Insofar as all translation is an act of interpretation, Into the Deep also impresses upon the reader the enduring value of early translations as primitive commentaries. Help feed my family by picking up a couple volumes. After all, who needs just one copy? The long wait is over. Logos 7 has arrived. At 8:00AM PT, Logos will be hosting a live event to walk you through some of the new innovations, benefits of the Logos 7 platform, and more. I’m thrilled to see the work I’ve helped put into this product—tutorials, the systematic theologies interactive and dataset, and some contributions to the Clementine Vulgate revers interlinear— finally released. I’m also thrilled about adding more books to me library. I hope you’re excited as well!